Despite yet again being given the underdog tag, VwS entered their winners final match knowing they were one game away from the CEVO Grand Finals. Things escalated quickly in the start of the game on Overpass with an exchange of rounds from both sides. LoS Pistoleros were prepared to do whatever it took to win as well. After the 15th round, VwS led 9-6 going into the second half. 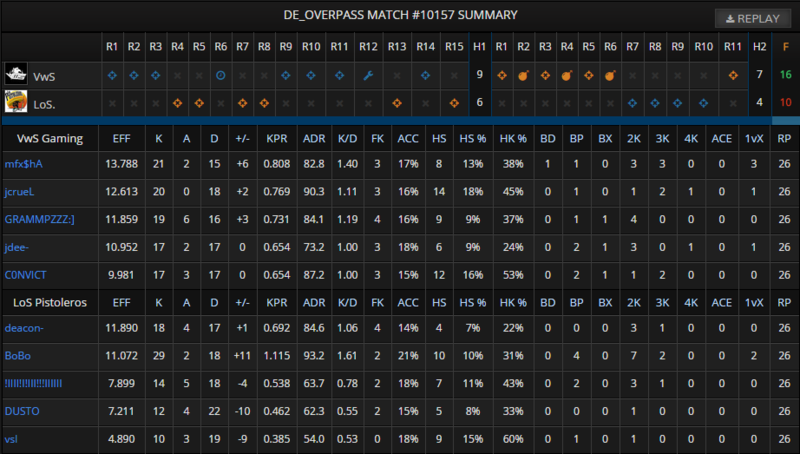 Despite Overpass being one of their weaker maps, they stormed to win 6 rounds in a row to take a 15-6 lead, guaranteeing at least overtime. LoS pistoleros surged back to win 4 straight, but the 9 round deficite proved to be too much. VwS won round 11 of the second half to secure a 16-10 victory and their rightful place in the Grand Finals. SO caught up on the moment he is! Well, I am likewise focused when doing research paper writing service! It does demand a lot of focus or you could lose the game! Students play the gaming and engineering students work on different gaming projects while also focus on pay4essayonline.blogspot.com for take hints for complete this projects and gain extra knowledge. High school studies have become very expensive and parents have reached to appoint of straining so as to keep their children in school unlike before when almost every parent afforded it without having to strain.